His novel is set on a train and involves a group of characters (familiar to readers of St. Aubyn's earlier work) who are locked in a debate about the nature of consciousness. As this train gets stuck at Didcot, and Charlie gets more passionately entangled with the dangerous Angelique, A Clue to the Exit comes to its startling climax. 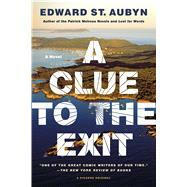 Exquisitely crafted, witty, and thoughtful, Edward St. Aubyn's dazzling novel probes the very heart of being. EDWARD ST. AUBYN was born in London in 1960. He is the author of Lost for Words, On the Edge and The Patrick Melrose Novels: Never Mind, Bad News, Some Hope, and Mothers Milk. His final Patrick Melrose novel is the standalone At Last. Mother's Milk was shortlisted for the Booker Prize.